When to use Respondent panels? You are doing research into a target market. When you need to reach a specific target audience. Identify product or pricing opportunities. Gain insight into your customer demographics. Measure and test brand awareness. What is a Respondent panel? A respondent panel is a way to get answers to a survey from a specific target audience in order to get valuable data. The participants in a respondent panel could be anyone with a computer and internet connection, which means that a wide variety of backgrounds and geographical locations gives you an opportunity to reach very specific target groups. Respondent panels are delivered by external providers and you will get all answers displayed directly in your Netigate account. The standard for all respondent panels is that you only pay for the answers you receive. Netigate have agreements for cooperations with multiple panel providers worldwide in order to swiftly be able to deliver to your specific requests. 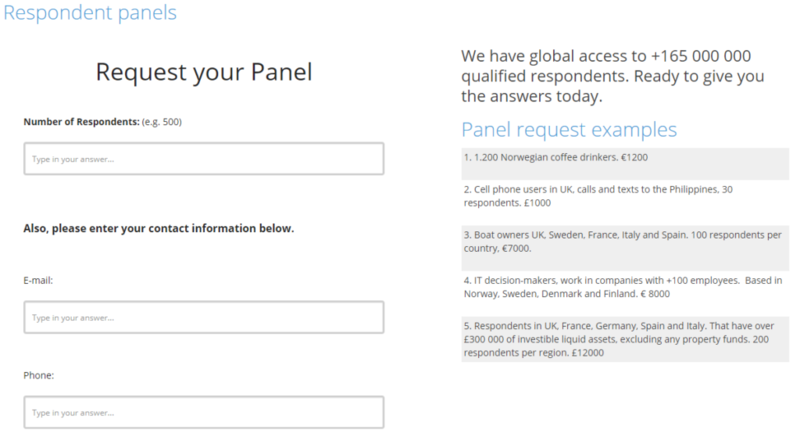 Why use a Respondent panel? The reasons for using a respondent panel could be many. In many cases, Netigate is used to gain insight and understanding in what affects consumers in their choices of products and services (price, treatment and time for example). In case you do not have direct contact with your users/customers, a respondent panel is a really good approach to gain this knowledge. Many companies choose to do these projects on a regular basis, to a smaller target group. For example, a weekly survey that is repeated for a set amount of time in order to create an understanding of how seasons and events can affect consumers. This type of survey is called Tracking surveys. If you have questions about your target group or have any other thoughts or ideas about market research you are welcome to submit a request or contact us directly at marketresearch@netigate.net and we will assist you.